Coach's Corner - NFL & NBA HOF'ers multi signed "JSA" certified 1998 Bobby Mitchell Program! Go Back to Lot List NFL & NBA HOF'ers multi signed "JSA" certified 1998 Bobby Mitchell Program! 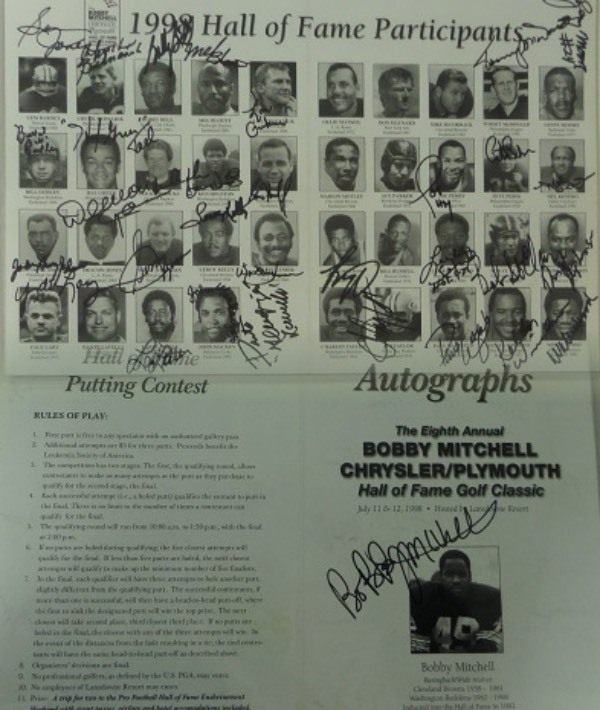 This foldout centerfold from an original 1998 Bobby Mitchell Golf Classic Program shows images of 39 different NFL and NBA Hall Of Fame greats, and is hand-signed in black sharpie by 33, including Mitchell himself on the reverse. The other 32 signatures are here on this foldout centerfold, including Tommy McDonald, Lenny Moore, Joe Perry Pete Pihos, Mel Renfro, Oscar Robertson, LeRoy Selmon, Bob St. Clair, Dwight Stephenson, Charley Taylor, Paul Warfield, Kellen Winslow, Willie Wood, Chuck Bednarik, Bobby Bell, Mel Blount, Lou Creekmur, Bullet Bill Dudley, Hal Greer, Ted Hendricks, Ken Houston, Sam Huff, John Henry Johnson, Deacon Jones, Sonny Jurgensen, LeRoy Kelly, Lanier, Yale Lary, Larry Little, John Mackey, Dante Lavelli, and Jim Taylor, and a copy of the original Huggins & Scott Auction JSA group LOA for authenticity purposes. A MUST for framing and display, and with so many HOF greats, and with so many no longer living, retail is low thousands!